Make your Pontiac GTO or Holden/Vauxhall Monaro/VXR8 "Tough-looking" with this Hood, Roof and Rear Deck Lid Rally Stripe Graphics kit. These retro Chevelle style stripes are packaged as a set of ten (10) or twelve (12) pieces - which includes two (2) Rear Deck Lid treatment options as shown! They're PRECUT and ready to install in a wide variety of colors with virtually NO TRIMMING required! This stripe package is not just a set of 10" strips in a box. Our graphic kit consists of prefitted and contoured pieces as shown in the illustration. This kit is specifically made for the '04-'06 Pontiac GTO or '01-'07 Holden/Vauxhall Monaro/VXR8 and will not fit any other vehicle. 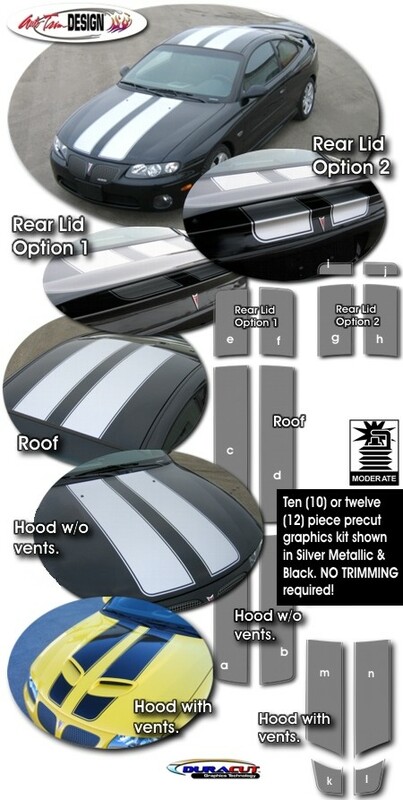 Choose your precut graphic kit for GTO/Monaro/VXR8's with or without factory hood vents as shown. Stripe width is approximately 10.5" (26.67cm) and set for a center spacing of 4" (10.16cm) while a .25" (.64 cm) pinstripe borders the outside edges as shown.